This study was performed to find the best experimental conditions for the electrochemical removal of the insecticide dimethoate (C5H12NO3PS2) from aqueous solutions using a lead dioxide niobium anode. The process was studied under galvanostatic polarisation mode. The influence of applied current density (10-50 mA.cm-2), initial chemical oxygen demand COD0 (100-550 mg.l-1), temperature (30-70°C) and pH (3-11) on COD and instantaneous current efficiency (ICE) was studied. The results showed that almost 90% of COD removal was achieved under optimal experimental conditions, indicating that electrochemical oxidation on a PbO2 anode is a suitable method for treatment of water polluted with dimethoate. It was found that the decay of COD generally followed a pseudo first-order kinetic and the oxidation rate was favoured by increasing the applied current density, temperature, pH and initial COD. 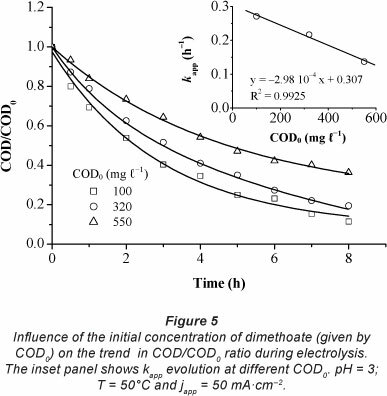 The greatest COD removal (90%) was obtained when using an applied current density of 50 mA.cm-2, COD = 320 mg.l-1, pH = 11, T = 70°C and electrolysis time = 8 h.
Dimethoate (O,O-dimethyl S-[2-(methylamino)-2-oxoethyl] phosphorodithioate) (Fig. 1) is a widely used organophosphorus (OPs) insecticide and acaricide applied to kill houseflies, as well as a wide range of insects and mites on a variety of fruit, vegetable, field and forestry crops. Like all OPs, dimethoate acts by interfering with the activities of cholinesterase, an enzyme essential for the proper functioning of the nervous system of insects and humans. A study showed that toxic effects and cholinesterase inhibition were observed in adult humans who ingested 30 mg a day or a higher dosage of dimethoate for 57 days (Hayes and Laws, 1990). Dimethoate is very toxic to birds, bees, fish and aquatic invertebrates (Cheminova, 1991). Dimethoate is degraded in the environment to another, more toxic, pesticide, omethoate; the proportion of omethoate in the total residue reaches about 50% after 5 weeks (FAO/WHO, 1985). Powerful degradation methods are required to destroy these pollutants in order to avoid their dangerous accumulation in the aquatic environment. Among the different technologies for wastewater treatment, biological oxidation is frequently used. However, if wastewater contains highly toxic compounds, biological treatment may be useless. For this reason, there has been an increasing interest in the use of new methods such as electrochemical oxidation. It has been proven to be a promising and attractive technique for the effective oxidation of wastewater containing organic compounds (Chen, 2004; Fernandes et al., 2004; Sanroman et al., 2004). Many studies have demonstrated that the complete mineralisation of organics can be obtained with high efficiency by direct electro-oxidation using only high oxygen overvolt-age anodes such as SnO2(Belhadj-Tahar and Savall, 1998; Comninellis and Pulgarin, 1993; Polcaro et al., 1999 Stucki et al., 1991), PbO2 (Andrade et al., 2007; Feng et al., 1995; Feng and Li, 2003; Martinez-Huitle et al., 2004a; Panizza and Cerisola, 2008; Quiroz et al., 2005; Samet et al., 2010a) and boron-doped diamond (BDD) anodes (Bechtold et al., 2006; Iniesta et al., 2001; Panizza and Cerisola, 2005; Samet et al., 2010b; Weiss et al., 2008). For example, some studies reported that the current efficiencies obtained with Si/BDD in oxidising 4-chlorophenol (Gherardini et al., 2001), 2-naphthol (Panizza and Cerisola, 2004), chloranilic acid (Martinez-Huitle et al., 2004a), and chlorpyrifos pesticide (Samet et al., 2010b) were higher than those obtained with PbO2 anodes. In contrast, Martinez-Huitle et al. (2004b) showed that the oxidation of oxalic acid was faster at Ti/PbO2 than at BDD, because the interaction of the oxalic acid with the PbO2 surface was particularly strong, and its anodic oxidation was limited only by mass transfer at higher current densities and lower substrate concentrations. Recently, Flox et al. (2009) have demonstrated that m-cresol is more rapidly removed with PbO2 than with BDD. Both PbO2 and BDD anodes exhibit good chemical and electrochemical stabilities, long lifetimes, and wide potential windows for water discharge. However, in the case of BDD, the financial expense can represent a serious drawback for industrial-scale wastewater treatment. In contrast, PbO2 anodes are mainly used in the electrolytic production of perchlorates and chlorates (Kuhn and Wright, 1971). These anodes are electro-chemically deposited on the metal surface. Titanium, niobium, tantalum and zirconium are widely used as substrate materials for their well-known properties, such as resistance to corrosion and chemical attack by acids, alkalis or salt solutions, and high mechanical strength. Various innovative technologies have been proposed for treatment of wastewaters containing dimethoate. These include the use of photocatalytic oxidation, using TiO2 as catalyst (Chen et al., 2007; Evgenidou et al., 2005), photo-Fenton process (Nikolaki et al., 2005), thermal decomposition (Andreozzi et al., 1999), ozonation (Liu et al., 2008), and microwave irradiation of dimethoate in aqueous solutions (Zhang et al., 2007). Only one paper related to electrochemical oxidation, using Ti/Pt anodes, was found in the literature (Vlyssides et l., 2004). For this reason, we have opted to study the electroche -ical degradation kinetics of dimethoate in aqueous solutions. The process was studied under galvanostatic polarisation mo e in acidic media using Nb/PbO2 anodes. The degradation rate of the studied pesticide and the limits of such a technique we e investigated according to experimental parameters. Pre-treatments of the niobium substrate (rectangular plates 70 mm x10 mm x1 mm) were carried out before anodisation to ensure good adhesion of the lead dioxide film. Niobium was first roughened to increase the adhesion of PbO2 deposit by subjecting its surface to mechanical abrasion using silica grains with an average diameter of 0.3 mm projected under 500 kPa pressure. It was then cleaned to remove sand particles or any other particles lodged on the metal surface. This process was carried out by degreasing with acetone, because of its ease of application and great penetrating power. The niobium was then ultrasonically rinsed in double-distilled water for 10 min. Achieving a uniform and well-adhered deposit requires a smooth surface with no oxides (formed spontaneously on contact with oxygen in the air) or scales. To ensure this, the niobium substrate was soaked for 30 s in hydrofluoric acid (40% weight) at room temperature, after which it was well-rinsed with double-distilled water. This process results in an average mass loss of niobium of about 0.156 mg-cm-2. The lead dioxide was deposited galvanostatically on the pre-treated niobium substrate by electrochemical anodisation of an aqueous Pb(NO3)2 solution (1 mol-l-1) placed in a single-compartment Pyrex glass cell (V= 200 cm3) thermoregulated at 65°C. The cathode was a cylindrical platinum grid (φ = 4 cm, L = 6 cm). The electrodeposition of PbO2 film was carried out at an apparent current density of 10 mA.cm-2 for 0.5 h, then at 20 mA.cm-2 for the same period, and finally at 50 mA.cm-2 for 1 h. The average mass of PbO2 was 0.22 g-cm-2. The deposit obtained was a grey porous material with strong adherence. Dimethoate solutions were prepared from an emulsifiable concentrate (Biomat 40 EC, from Arysta Lifescience) containing 400 g-l-1 dimethoate. All of the previous solutions were freshly prepared using double-distilled water and kept in the dark to avoid any photochemical reactions. Sulphuric acid and sodium hydroxide were of analytical grade and were purchased from Merck. Galvanostatic electrolysis of dimethoate aqueous solutions (150 cm3) was carried out in a 2-compartment thermostatic cell (Fig. 2). The cathode was a graphite carbon-PTFE bar (φ = 5 mm; L = 60 mm) placed in a porous ceramic cylinder (Norton, RA 84) containing 1 mol-l-1 sulphuric acid solution. The anode is made up of 2 Nb/PbO2 plates arranged symmetrically around the cathode; the surface of each plate not facing the cathode was masked with a protective film (transparent polyethylene type, Scotch TM 480, 3M). The geometric working surface of each plate was 5 cm2. Dimethoate solutions were electrolysed in galvanostatic mode using a DC power supply (model ABTP 530 Fran^aise d'Instrumentation, France). The range of applied current density was 10 to 50 mA.cm-2. The pH of the solution was adjusted, before and over the course of the electrolysis, by adding either concentrated sulphuric acid or sodium hydroxide solutions. 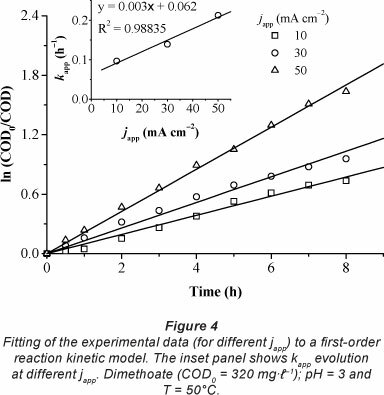 Measurement of chemical oxygen demand (COD) during the process permitted evaluation of the kinetics of organic matter decay and mineralisation efficiency. Several authors used only COD measurements to follow organic matter decay during oxidation of organic compounds (Hmani et al., 2009; Panizza and Cerisola, 2008). 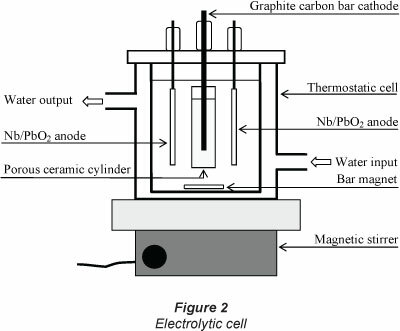 In electrolysis using anodes with high oxygen evolution overpotential, such as PbO2, the organic pollutants are mainly mineralised on the anode surface by the adsorbed hydroxyl radicals (HO-) electro-generated by water discharge (Eq. (1)). The stoichiometry of dimethoate combustion indicates that 12 mol of O2 are needed for the complete oxidation of dimethoate (Eq. (2)). When we compared the initial concentration of dimethoate in the solution prepared from the emulsifiable concentrate (Biomat 40 EC containing 400 g-l-1 dimethoate) to that calculated from COD0 (Eq. (3)), we found a difference of about 7%. In this study, during electrolysis, we used COD as an indi ator for the presence of dimethoate and its by-products. COD was determined by the dichromate method. The appropriate amount of sample was introduced into a prep red digestion solution (0-1 500 mg.l-1) containing potassium dichromate, sulphuric acid and mercuric sulphate, and the mixture was then incubated for 2 h at 150°C in a COD reactor (WTW CR 2200 thermoreaktor Germany). COD concentration was measured colorimetrically using a DR/2010 spectrophotometer (Hach Company, USA). 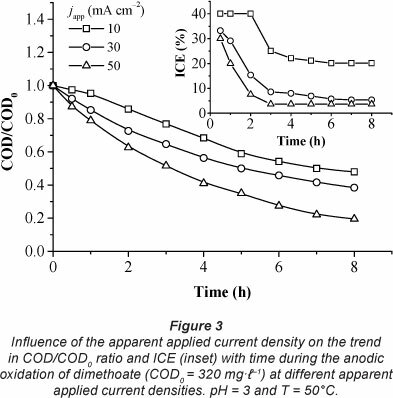 Figure 3 shows the trend of the COD/COD0 ratio and ICE with time, for the anodic oxidation of dimethoate solution (COD0 = 320 mg.l-1) on the PbO2 electrode, at different apparent current densities (10, 30 and 50 mA.cm-2). It is clear that COD/ COD0 ratio decreased almost exponentially with time and that the COD removal rate increased with increasing current. However, under these experimental conditions, the complete degradation of the organic matter was not reached. After 8 h of electrolysis, COD per cent removal increased from 54 to 81% when the apparent applied current density increased from 10 to 50 mA.cm-2. Figure 4 shows that the results are in agreement with Eq. (6), as indicated by the high value of the regression coefficient (R2> 0.98). If japp is lower than j0lim, the electrolysis is under charge-transfer control; the instantaneous current efficiency is then 100%. If japp is higher than j0lim, the electrolysis is under mass-transport control; secondary reactions (such as oxygen evolution) occur. 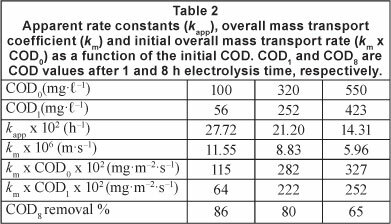 Table 1 shows that j0lim values were lower than japp values; thus the electrolysis was under mass-transport control. This is in agreement with the trend for ICE calculated from Eq. (4), as shown in the inset of Fig. 3. ICE was always below 100% and decreased when japp increased. ICE decreased significantly when japp ranged from 10 to 30 mA.cm-2 since a (japp/j0lim) was amplified approximately twice (a increased from 6.75 to 12.29, as shown in Table 1). However, there was no significant change in ICE values between 30 and 50 mA.cm-2 current densities (inset of Fig. 3) due to the low variation of a within this range. 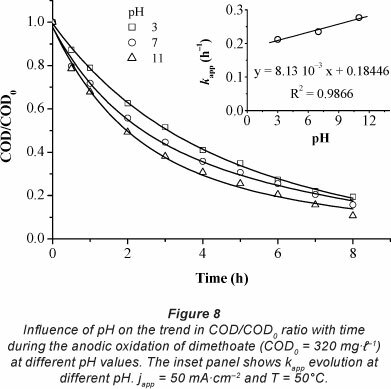 Figure 5 shows the trend of COD removal with time during the anodic oxidation of dimethoate at different initial concentrations (COD0: 100, 320, and 550 mg.l-1) using an apparent current density of 50 mA.cm-2, at pH 3 and 50°C. The results indicated that COD per cent removal decreased with an increase in initial COD. After 8 h of electrolysis, COD per cent removal decreased from 85 to 65% when initial COD increased from 100 to 550 mg.l-1. Considering a pseudo first-order reaction for COD removal, kapp values calculated from the straight lines decreased progressively from 27.72-10-2 to 14.31-10-2 h-1 when the initial COD ranged from 100 to 550 mg.l-1, as shown in Table 2. However, overall mass transport rate (km x CODt) increased with increased concentrations of dimethoate. Consequently, the COD removal rate was faster when the initial COD was higher. This process can be interpreted in terms of an increase in the overall mass transport rate to the anode surface. In fact, when COD0 increased, the rate of formation and detachment of O2 bubbles (Eq. (8)) decreased. Thus the mass transport rate can be significantly increased. The electrolysis of dimethoate solutions (COD0 = 320 mg-t 1) at the PbO2 anode, at an apparent applied current density of 50 mA.cm-2, was carried out at different temperatures, in the range of 30-70°C. Figure 6 shows that an increase in temperature had a positive effect on the COD removal rate. The amount of organic matter decreased more quickly at 70°C than at 30°C. After 8 h of electrolysis, COD per cent removal increased from 22% to 93% when the temperature ranged from 30 to 70°C. This result is probably due to the increase in the indirect oxidation reaction of organics by the electro-generated oxidising agent S2O82- from the supporting electrolyte H2SO4 (Eq. (9)). Several authors have shown that S2O82- formed at the PbO2 anode surface participates in the oxidation of the organic matter in proximity to the electrode surface and/or in the bulk of the solution (Amadelli et al., 2002; Aquino et al., 2010; Flox et al., 2009; Liu and Liu, 2008). This results in an increase in COD removal rate with temperature. These results are in agreement with those obtained by other authors (Canizares et al., 2005; Michaud et al., 2000). Moreover, the decrease in the viscosity of the medium with increase in temperature enhances the diffusion rate of organic matter to the anode surface. Consequently, an increase in temperature plays a role in an increase in COD removal rate. The same explanation was suggested by Rodriguez et al. (2009). T is the absolute temperature (K). 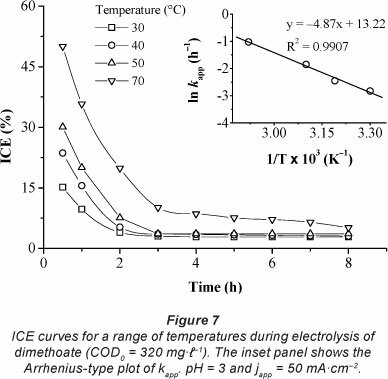 Due to the narrow temperature range employed in this study (30-70°C), variations of the pre-exponential factors and the apparent activation energy of the empirical Arrhenius expressions of the COD removal may be ignored. The variation of ln kapp versus 1/T is plotted in the inset of Fig. 7. A good linear relationships exists between the plot of ln k and 1/T. Based app on the slope (-Eapp/R) and intercepts (ln A) of the plot in Fig. 7, Eapp and A in Arrhenius form (Eq. (10)) were determined as 35.58 kJ-mol"1 and 152.78 s-1, respectively. E for app a diffusion-controlled homogeneous reaction is typically less than 40 kJ-mol-1 (Belhadj-Tahar and Savall, 1998). The experimental result was considerably lower than this value; it is therefore likely that the limiting step of dimethoate oxidation is of a diffusional nature. Many studies have reported on the effects of solution pH in anodic oxidation of organics on PbO2 anodes, but the results are contradictory. For example, Kirk et al. (1985) found that the current efficiency for the oxidation of aniline at a PbO2 packed-bed anode increased from 3% to 13% as pH increased from 2 to 11. In contrast, in a previous study (Samet et al., 2006) we demonstrated that the oxidation kinetics for 4-chloroguaiacol removal using PbO2 anodes were faster at pH 2.0 than at pH 6.0. Recently, Panizza et al. (2008) demonstrated that the effect of pH was not significant for the oxidation of methyl red at PbO2 and BDD anodes. The same result was observed by Chen and Chen (2006) when they studied the oxidation of orange II at a BDD anode. These discrepancies can be explained by the differences in the chemical properties of the organic compounds tested. To study the influence of pH in the oxidation of dimethoate, electrolyses were carried out at 3 initial pH values in the range of 3-11 (Fig. 8). It was found that, within the pH range studied, COD removal was slightly affected by solution pH. After 8 h, COD per cent removal increased from 80 to 90% with an increase in pH from 3 to 11. A pH of 11 appeared to be the optimum value. The inset of Fig. 8 shows a slight increase in k with increasing solution pH. PbO2 anode displayed noticeable oxidation abilities for treating wastewaters containing this pesticide, due to the production of a large amount of hydroxyl radicals on the electrode surface during electrolysis, in the potential region of water oxidation. Organics degradation was a diffusion-controlled process with a higher rate of COD removal obtained at high apparent applied current density (50 mA.cm-2). An increase in temperature significantly improved the COD removal rate. 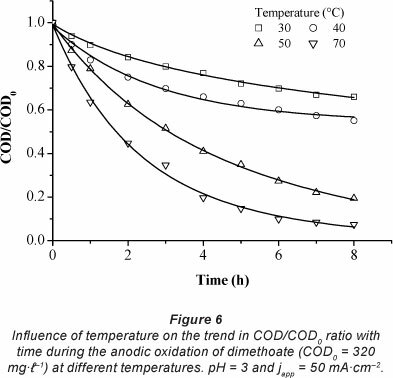 For COD = 320 mg.l-1, j = 50 mA.cm-2, app pH = 3 and T = 70°C, 90% of COD removal was achieved after 8 h.
Dimethoate degradation was favoured when operating at low initial COD. Solution pH had only a slight positive effect on COD removal. This work was financially supported by the Tunisian Higher Education and Scientific Research Ministry. It was also linguistically revised by English teacher and researcher Mohamed El-Behi. Accepted in revised form 16 November 2012.